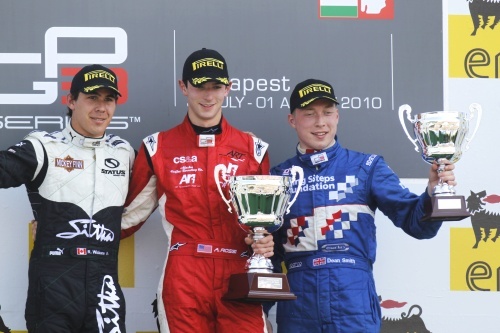 Racing Steps Foundation backed GP3 Series racer Dean Smith took his first podium finish in the FIA Formula One World Championship-supporting category in Budapest, Hungary, on Sunday, 1st August, to brilliantly cap off his strongest weekend of the season. Easily his most trouble-free and successful event since the championship curtain-raiser at Barcelona in early May, the 22-year-old McLaren Autosport BRDC Award winner qualified very competitively in fifth place for round 11 on Saturday before securing a comfortable top five finish in the race. Placing him fourth on the ‘reverse’ grid for round 12 at the Hungaroring, Dean made an excellent start to move into third place on the inside through the first corner but was forced back to fourth a few turns later behind category race winner Robert Wickens. Struggling with oversteer which limited how much he was able to push, Wolverhampton based Dean still managed to stay clear of Stefano Coletti and series leader Esteban Gutierrez but the podium just looked out of reach. Then, three laps from the finish, Carlin team-mate Josef Newgarden was forced to pull off from second place with a fuel pump problem which enabled Dean to go through to third. In a season which has been blighted by mechanical problems, the BRDC Superstar finally managed to benefit from a relatively smooth weekend in Hungary and proved his undoubted talent. Importantly, the double points finish also means he has climbed up the championship into equal seventh place. “It’s awesome to get our first podium of the year and to also take some good points from both races, I’m really pleased”, said the 2009 Formula Renault UK Champion, “We could have had pole for the first race but I only had one good lap at the end due to yellow flags. The race went pretty well though, I had a good start to move into fifth and that was it. The weekend certainly started smoothly for Dean with a best lap in pre-event testing on Friday afternoon of 1m38.754 seconds to place him ninth quickest and within just three 10ths of a second of the top two. Qualifying on Saturday morning took place on a drying track and the Tomax managed racer did hold pole position into the second half of the session. Disruptions due to yellow flags cost him the chance to retain the top spot but he still ended the run with the fifth fastest time. He was then given a one-place grid penalty for round 11 though after being deemed to have committed the innocuous infringement of taking the chequered flag twice during practice the day before. Therefore starting Saturday’s race from sixth place on the grid, a good getaway enabled Dean to instantly move into the top five where he remained to the chequered flag on lap 16. There is now a four week break from competitive action with rounds 13 and 14 of the GP3 Series, the penultimate event of the 2010 championship, taking place at Spa-Francorchamps as support to the Belgian Grand Prix over the weekend 28th/29th August.